A huge welcome to Alison, from Oopsey Daisy!! Once upon a time, I was a first grade teacher. Naturally, I collected A LOT of books… Can you believe that I’ve had over 1,000 books just sitting in plastic tubs in our garage?! They have been in desperate need of a little organization! I finally collected ALL of my books, cataloged them, and color coded them so that even my 2-year-old Little Man can put them away. 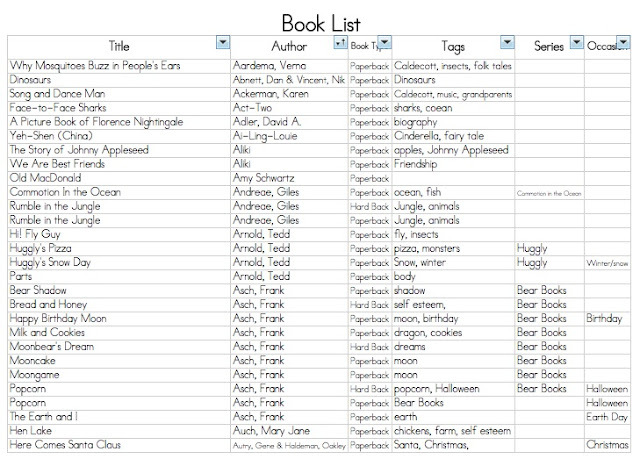 The first step was cataloging every.single.book! I decided to organize the books by author’s last name. But I also tagged the books by topics, series, holidays, etc. so I could easily find books that I want to pull for a special occasion. Now I can easily check to see if I have a book before purchasing a duplicate copy! 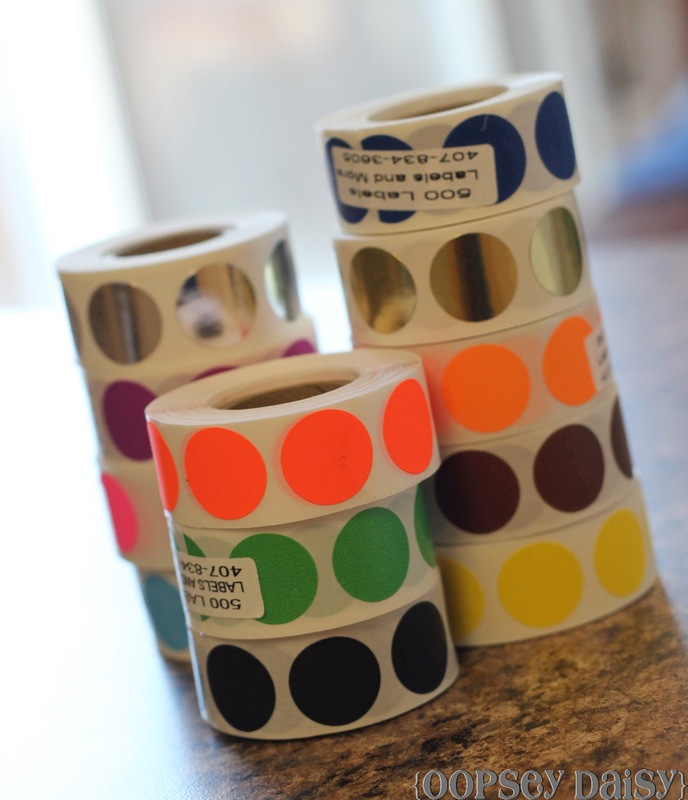 Doesn’t this rainbow of dot stickers make you happy?! Well, I ordered all different shades of dots to help me color code the books. Next, I created a book key for each letter of the alphabet. 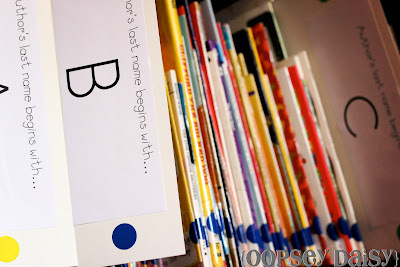 I labeled board books, golden books, and chapter books separately so they had their own dot color. I added dots and stars to dots to vary them a bit. 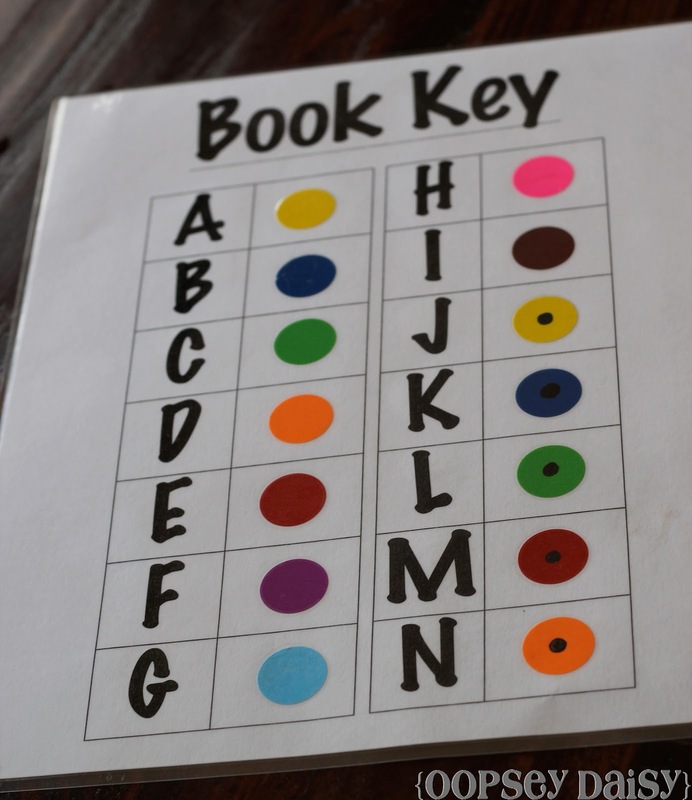 As I cataloged each book in my list, I matched the author’s last name to the book key to the appropriate colored dot. 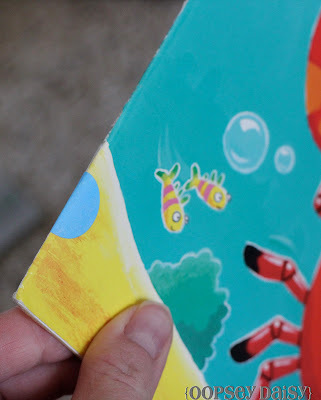 I stuck the colored dot to the spine of each book, and used book tape to secure it. Isn’t this a happy sight?! 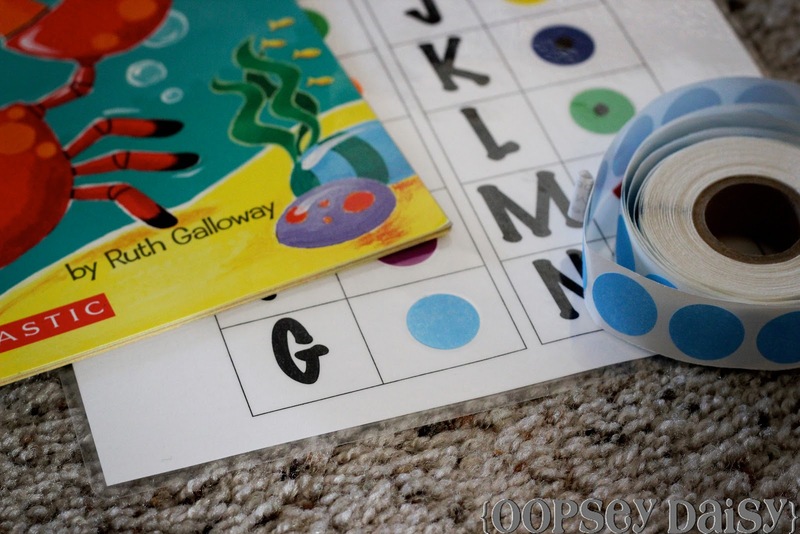 Using poster board, I created sections for each letter of the alphabet with matching dot stickers. We were lucky enough to find a set of book shelves that fits into Little Man’s closet. We have been teaching him how to match the colored dot on the books so he knows where to put his books away. So far he follows the rules like a champ! For now, he has full access to these shelves in his bedroom. I plan on rotating the books on these shelves so he is constantly entertained by new books. This Little Man has always loved to read books. Now, we finally have a book organization system that works for us! Thanks so much, Kierste, for letting me share today! Okay, I am LOVING this catalog system! 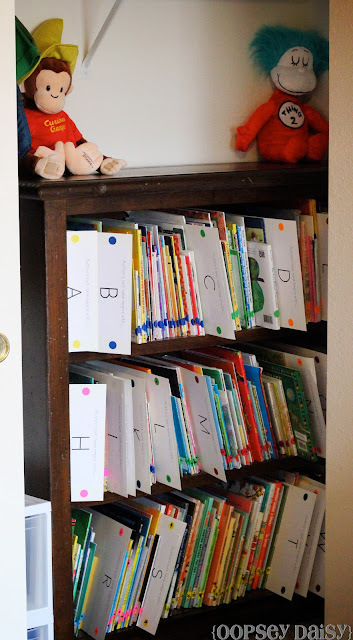 We have so many kids books, and this is such a great way of not only knowing what you have and getting them organized, but allowing little ones to know how to get them back where they go. Genius! Thank you so much, Alison! 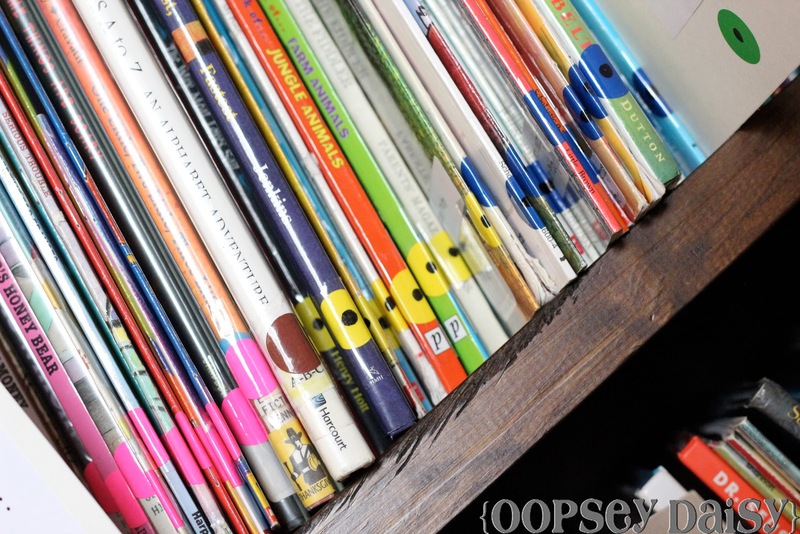 For even more great ideas, head on over to Oopsey Daisy! You're Brilliant! I LOVE this idea. 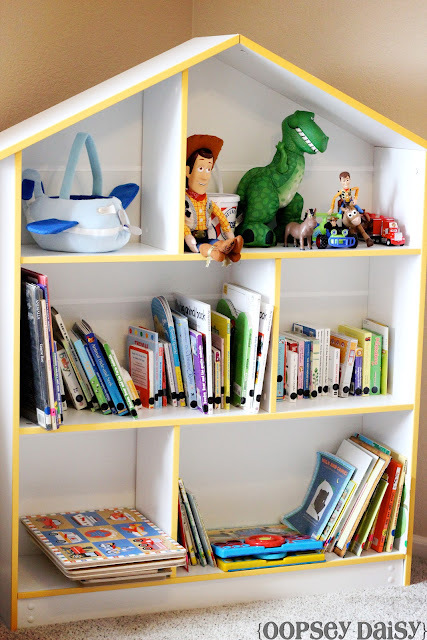 I LOVE how you put it together, for your very own fantastic library! Thanks for sharing! Alison, you are amazing. That is a lot of books. I LOVE IT!! 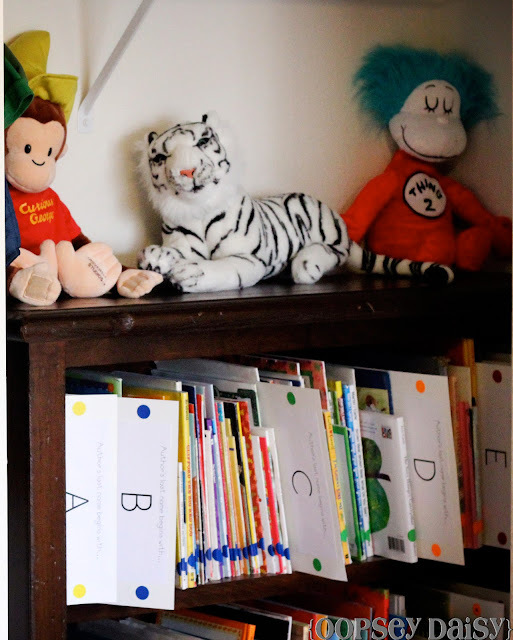 I think the more books the better :) Love how you organzied them all. I love the catalog!! I Have to do that with our books!! OOHHH, you got me. I too used to be a first grade teacher and have a ridiculous amount of messy books. Your system and organization got my heart beating fast! Ha Ha The colors are great for the little ones who don't know their letters yet! AWESOME!!!! Awesome job Alison! LOVE that. Oh, I could hug you! 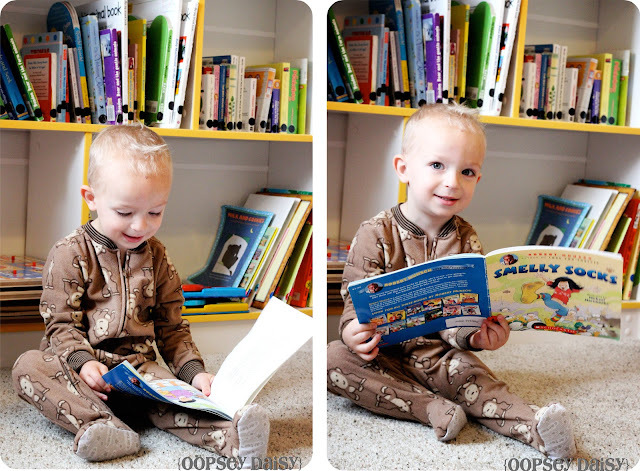 My boys love books and I love that, but I cannot stand books laying on the floor, jumbled on the shelves, etc. What an awesome idea of teaching little ones how to keep order to their books. Thank you, thank you!! When I taught first grade this is EXACTLY how I organized my books. I dont know why I never thought to do it in my own home! Thanks for the inspiration Alison! LOVE IT!! Only a teacher could come up with this…thanks for sharing! L.O.V.E love this! Fantastic job, Alison!! I've been waiting to see this!! :) Just stumbled it! In my kindergarten classroom I have a color dot system for genres, pink is poetry, green is nonfiction, red is fantasy. The books all face out in tubs so kids can see the cover when picking a book.